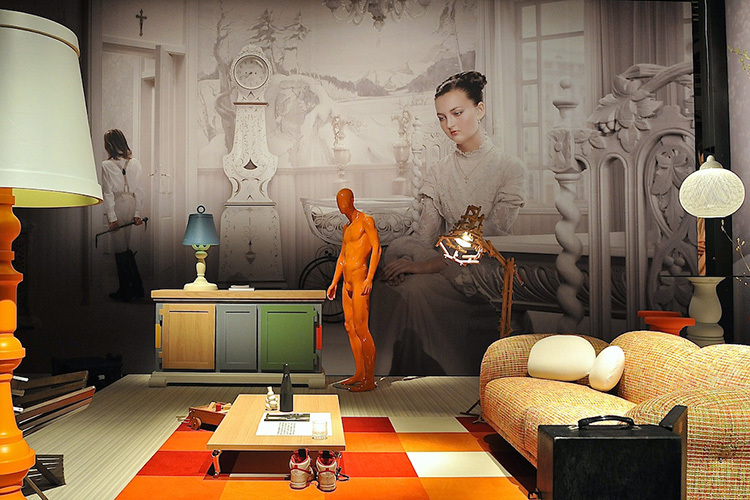 Moooi Unexpected Welcome with Erwin Olaf // Milan 2013. 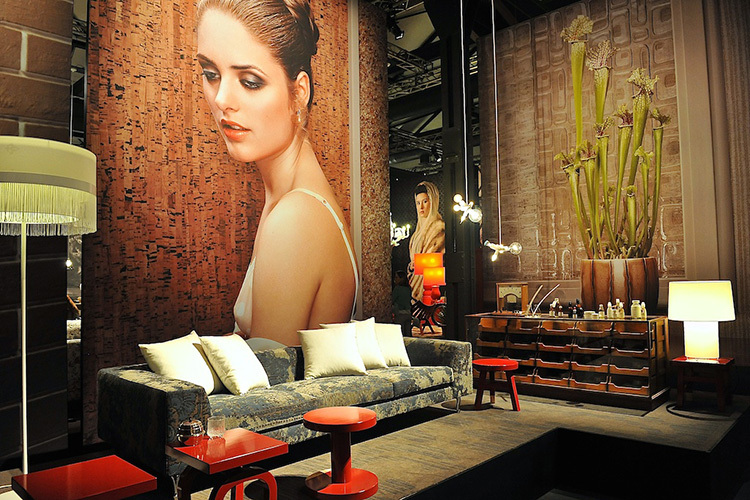 I am extremely excited to be partnering with to bring you my comprehensive Milan 2013 report. 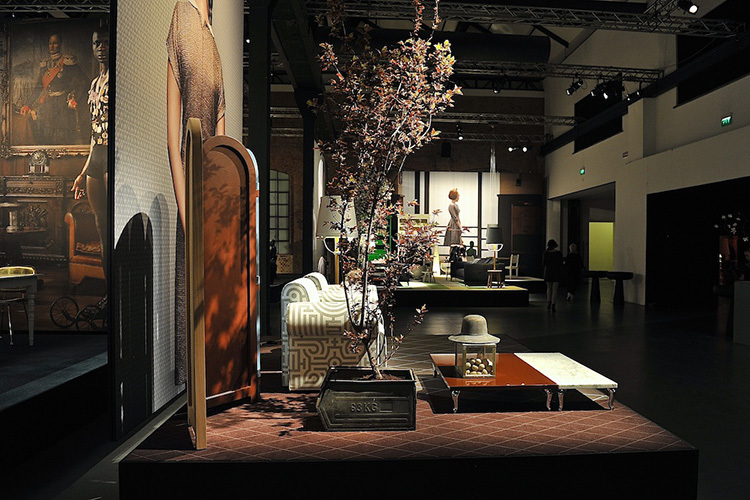 Over the next couple of weeks, you can expect to see a series of posts which will cover my favourite moments, products, places and installations from and Milan Design Week in more detail. All of this is made possible by our friends at , and I really want to thank them for their valuable support. Ok, seriously now. 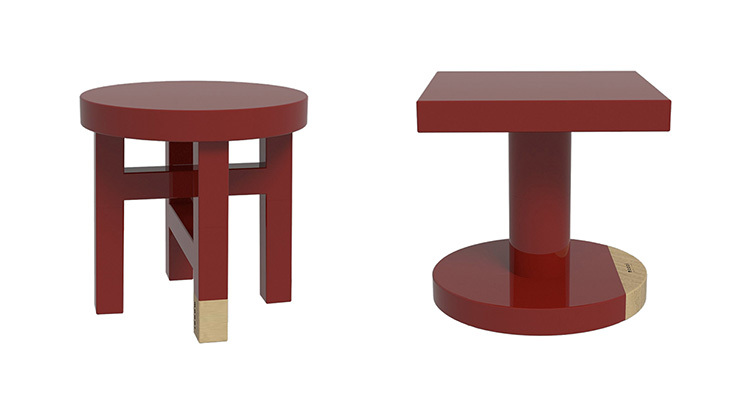 Feel free to get super excited as we will literally be saturating ourselves in extreme design goodness on steroids. Good or good? Great! 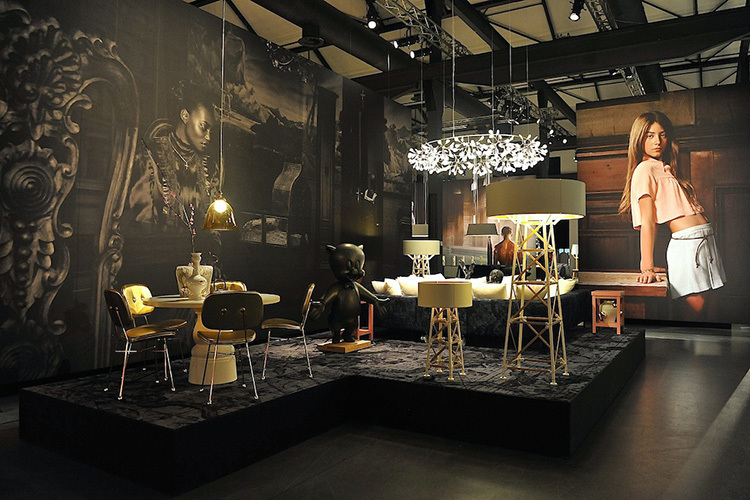 Unexpected Welcome by , held at 56 Via Savona in Milan. Photos by Nick Hughes // © Yellowtrace. 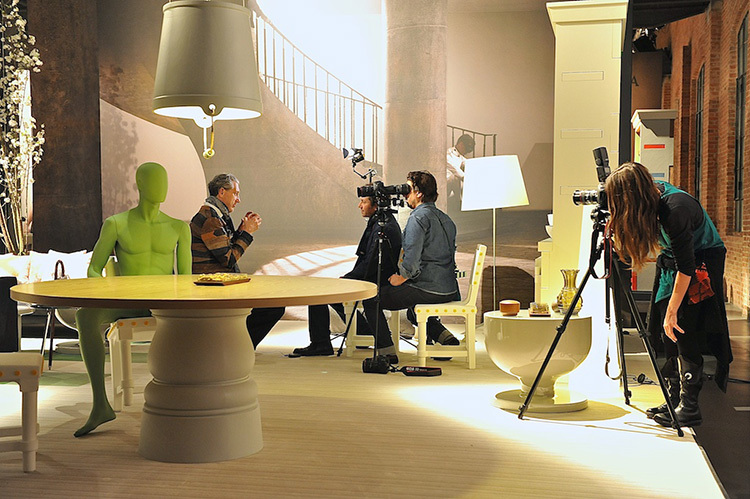 I decided to begin my Milan report with one of my favourite shows during the busy week – Unexpected Welcome by . My excitement about this event started to build several weeks ago after I received a to attend a very special preview. 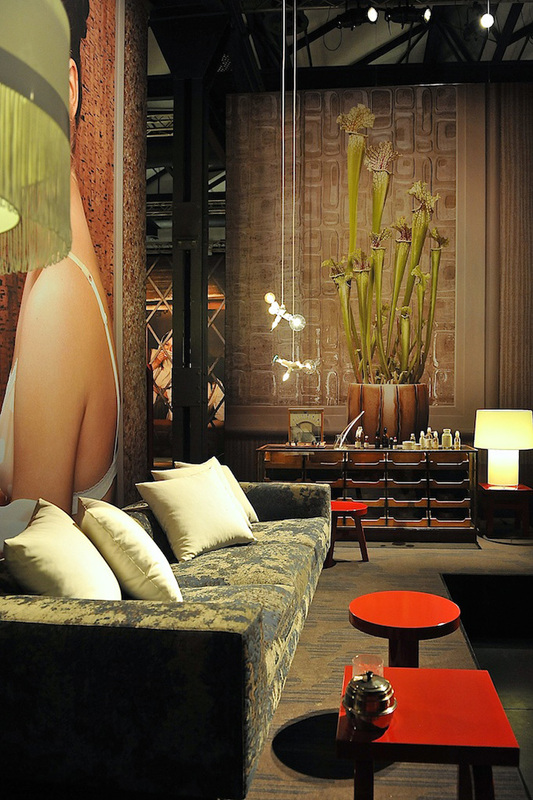 Not only was I thrilled about the invitation itself (ummm, heeeellllooooo // oh hi Yellowtrace, we think you’re pretty excellent, so why don’t you come hang with the best of the best in Milan… there will only be about 10 of us there… // I mean, who wouldn’t be excited about THAT?!) 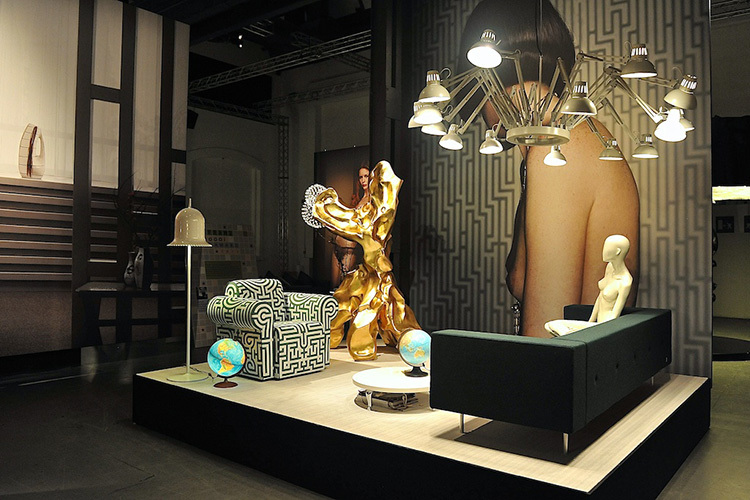 I was also really keen to experience Moooi’s biggest showing in Milan to date. Unexpected Welcome was precisely as the name suggests. A world unto itself dreamed up by and their long term collaborator . 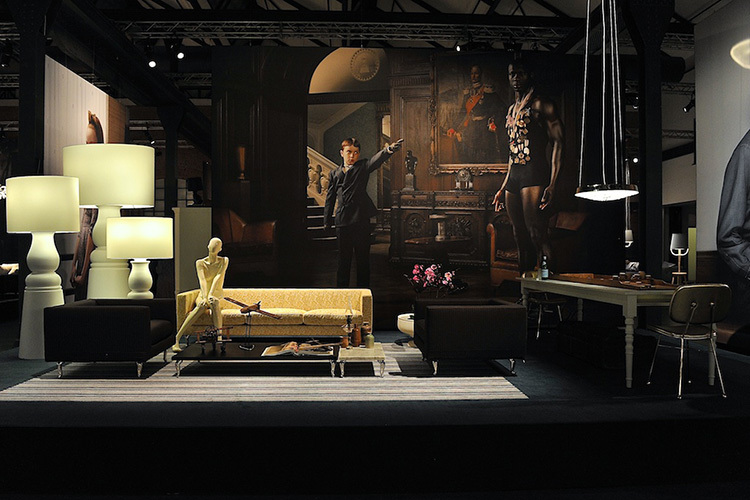 The Dutch company transformed a vast 1,700sqm space into a series of hyper-real dramatically lit sets displaying new product by , , , , , , , , , /Bart Schilder and . 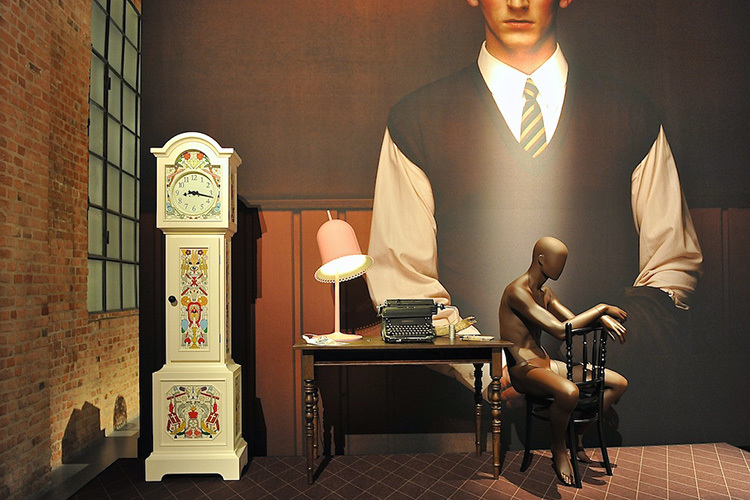 These sets were paired with 4.5m tall super-sized backdrops of arresting images by the master Dutch photographer. Each setting provided an escape and told it’s own story. 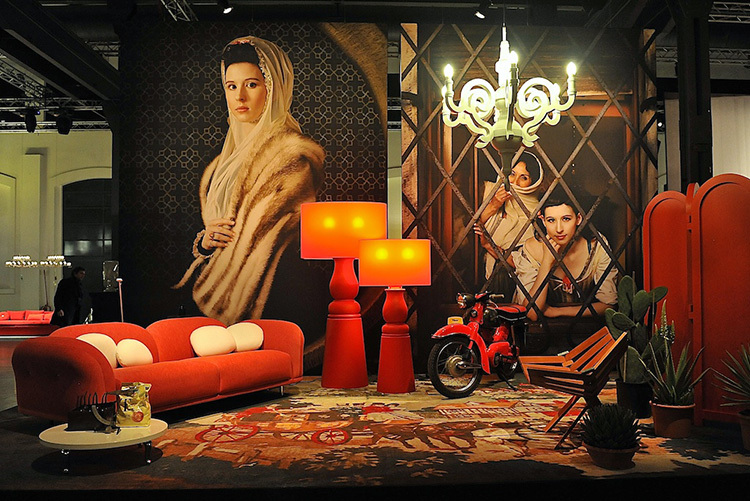 There was a beautiful tension created by the irreverent, sometimes flirtatious styling of the furniture, props and lighting, while the haunting and enigmatic backdrops provided a real sense of grandeur and drama. 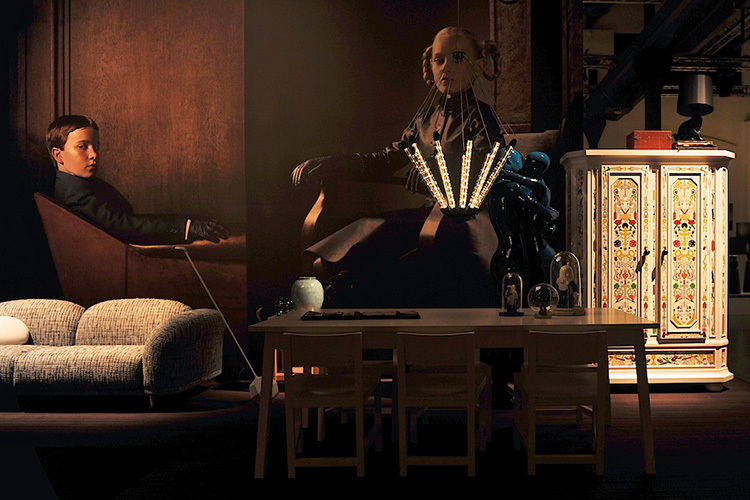 Just like these perfectly executed images layered with narrative, the art direction and styling of Moooi’s collection matched the attention to detail in it’s own unique way. 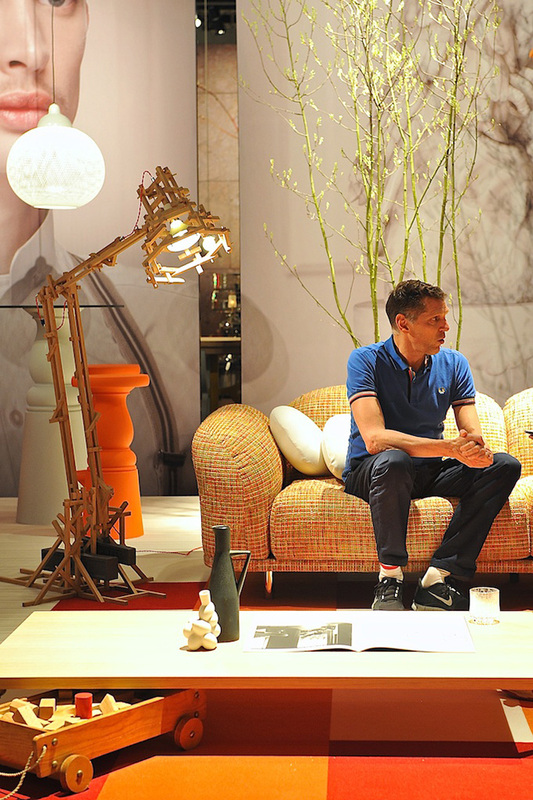 That’s me having a laugh about something or other while chatting to Casper Vissers (CEO of Moooi who was fantastic to talk to). 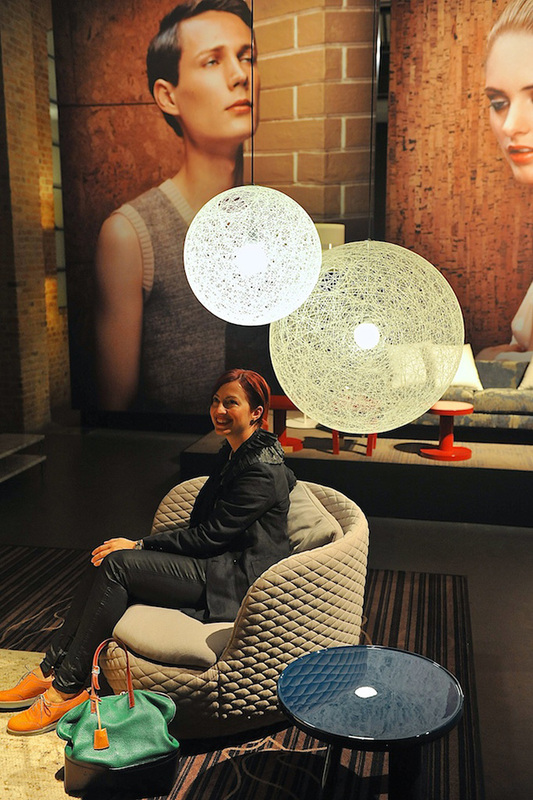 I am sitting in the new Bart Armchair, designed by Moooi Works/Bart Schilder. I began to imagine each setting as a home, a hotel, a restaurant, a lobby, a retail space or a club, and concluded neither of them quite matched any of those spatial typologies. At the same time I imagined that each setting could serve as any one of those spaces quite easily. 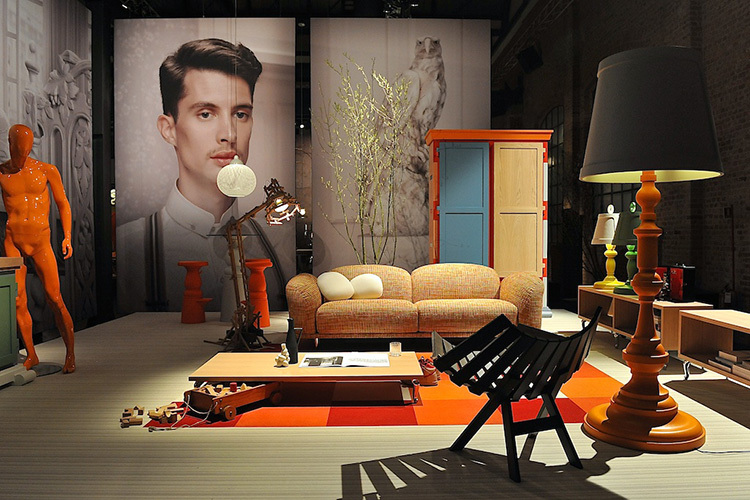 For me, this is a true testament to a successful collaboration and superb art direction and styling. 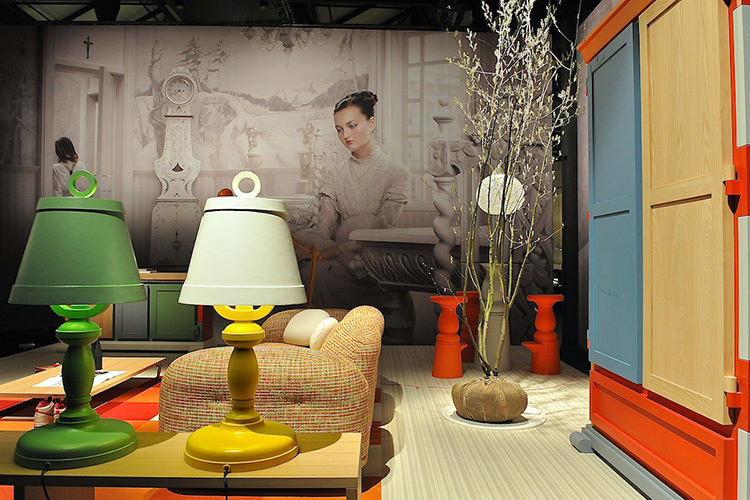 An entire concept nailed and executed perfectly. 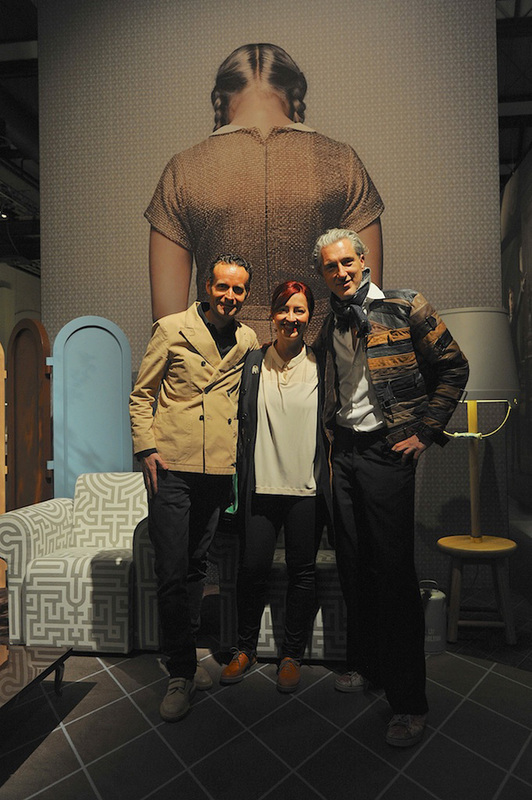 That’s a particularly unflattering photo or me in a Moooi sandwich – Casper Vissers (CEO & Founder) on the left, and Marcel Wanders (Creative Director & Founder) on the right. 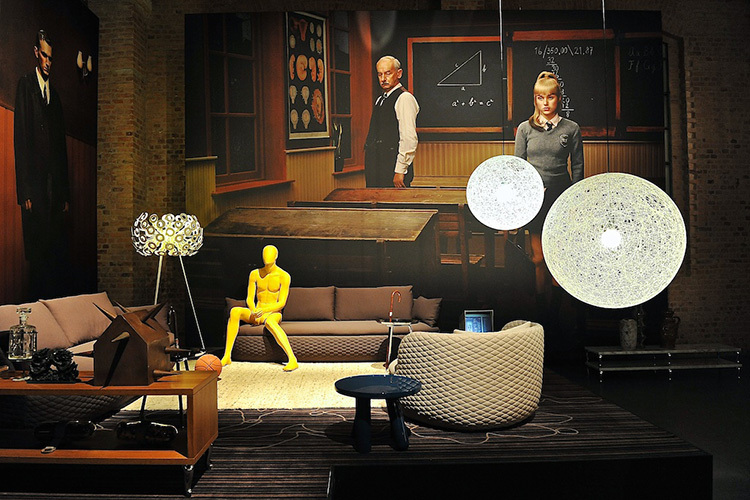 In case you feel like you haven’t seen enough of this installation from our photos (doubt it! ), you can see a 360° panorama of the show by clicking . And with this many images in the post already, why stop now, right? Exactly. 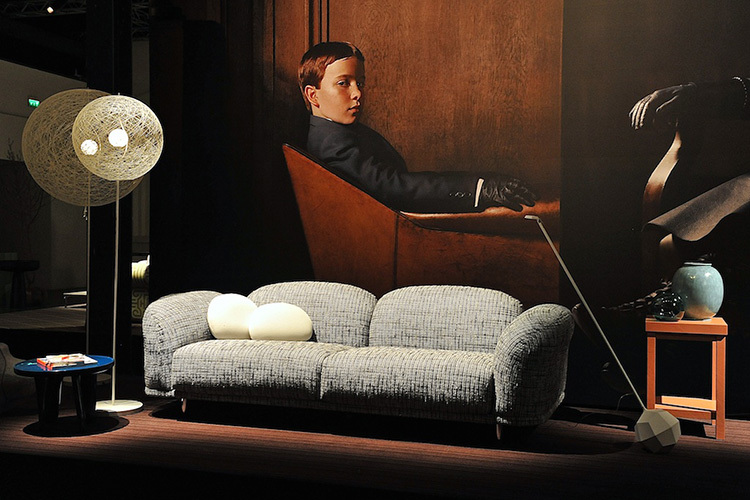 Below are a few of my favourite pieces from Moooi’s new collection launched in Milan. 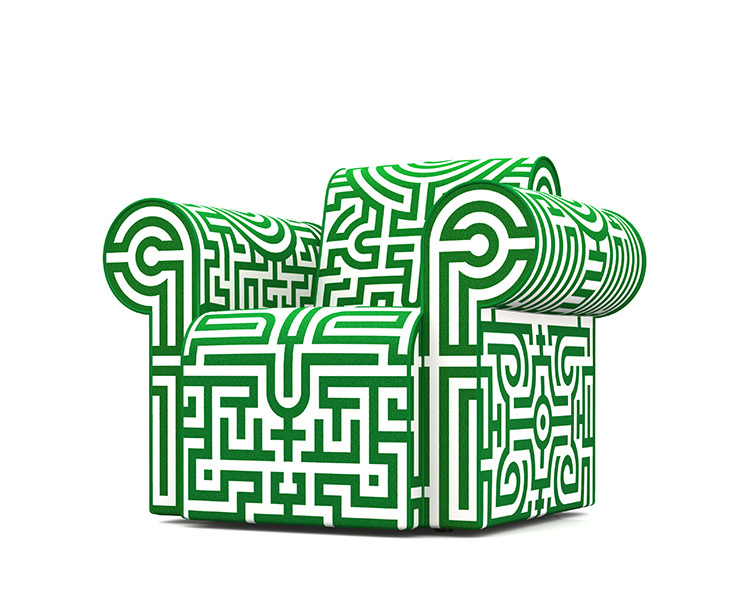 Labyrinth Chair Original by for Moooi. 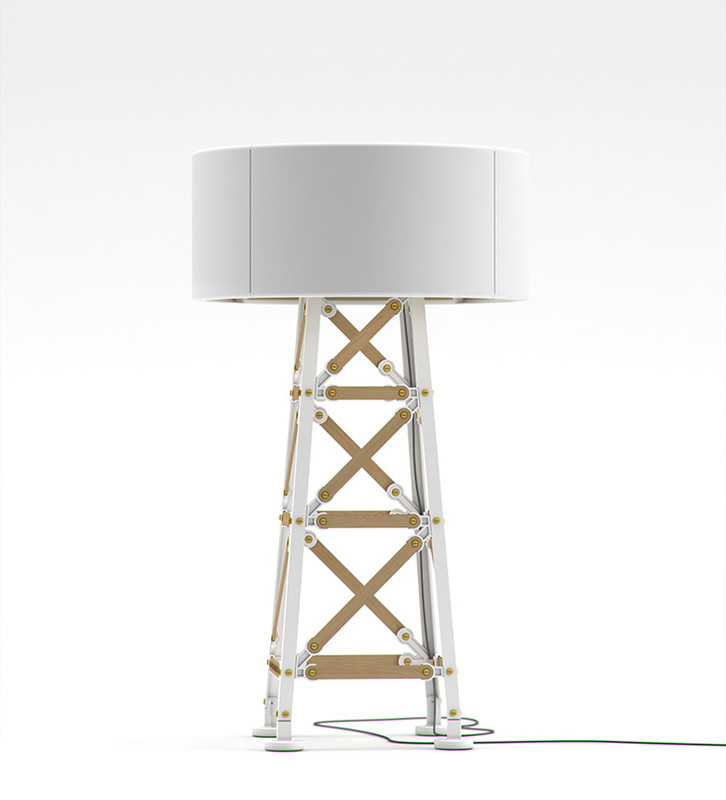 Bucket Floor Lamp by for Moooi. 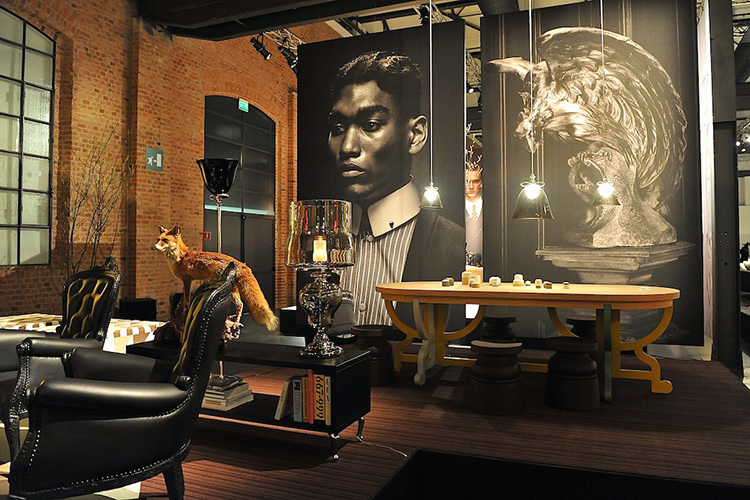 ‘Common Comrades’ Scholar (left) and Tailor (right) by for Moooi. 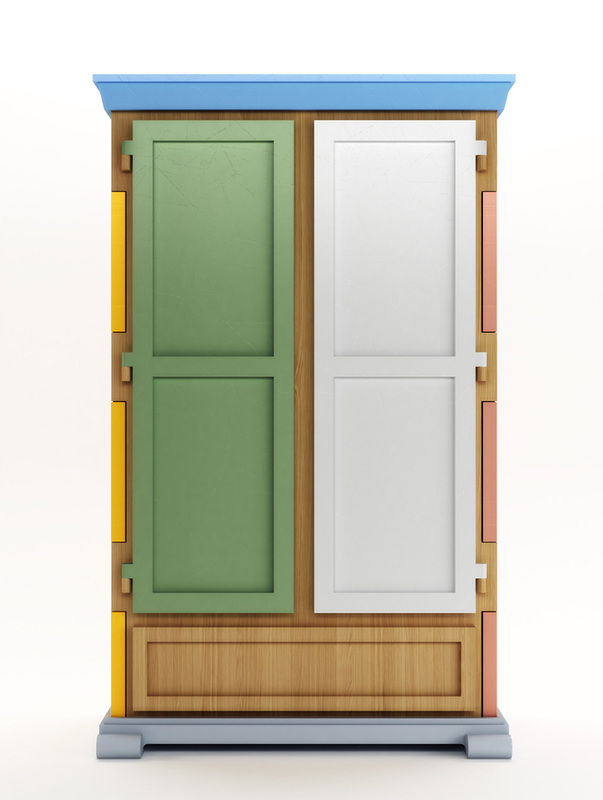 Paper Patchwork Wardrobe by for Moooi. 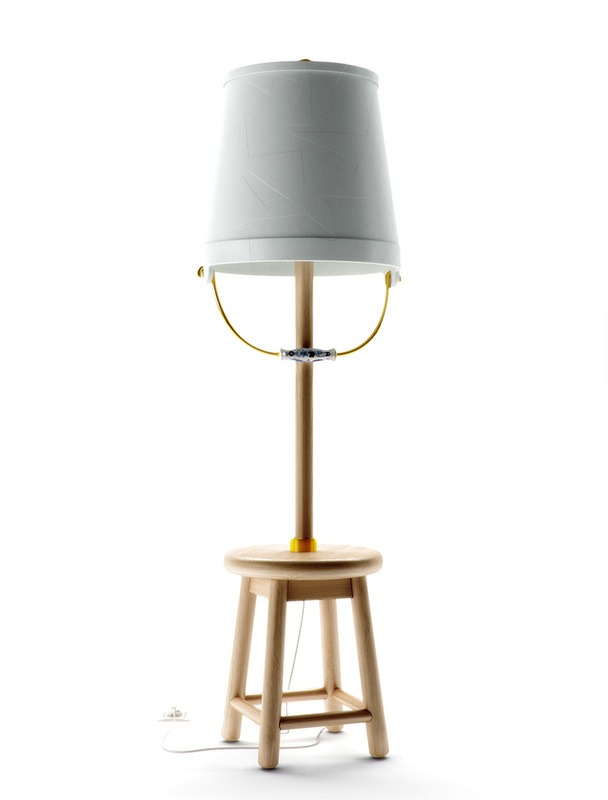 Construction Lamp WhiteWood S 80 by for Moooi. 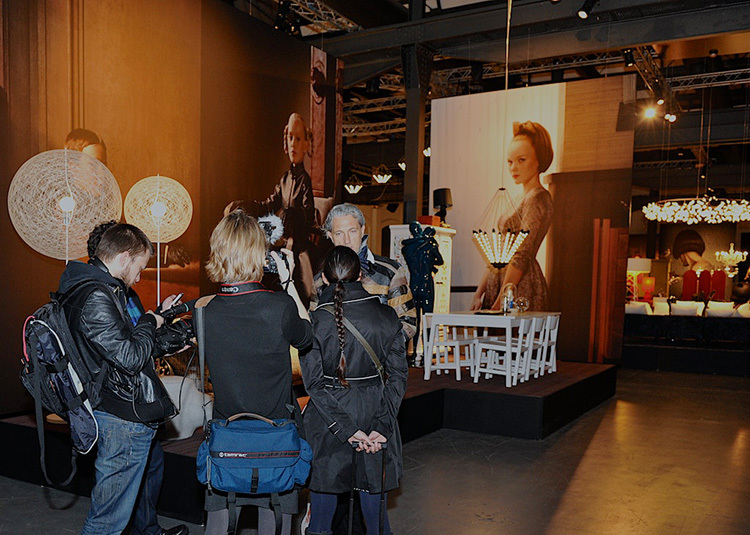 Yellowtrace & Yatzer // Best of Milan Design Week 2013. Crescent House by Andrew Burns // Sydney. 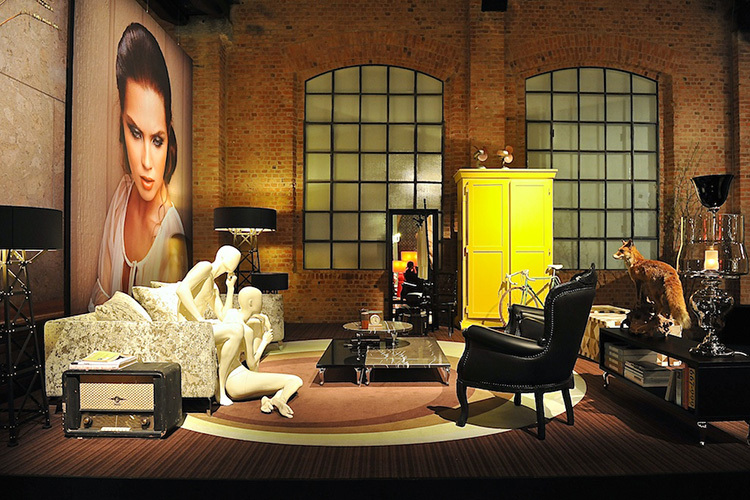 You look fantastic and fit in very well to your stylish surrounds. Wow. This has certainly brightened up my Tuesday morning. Love it! Fantastic photos by Husband. 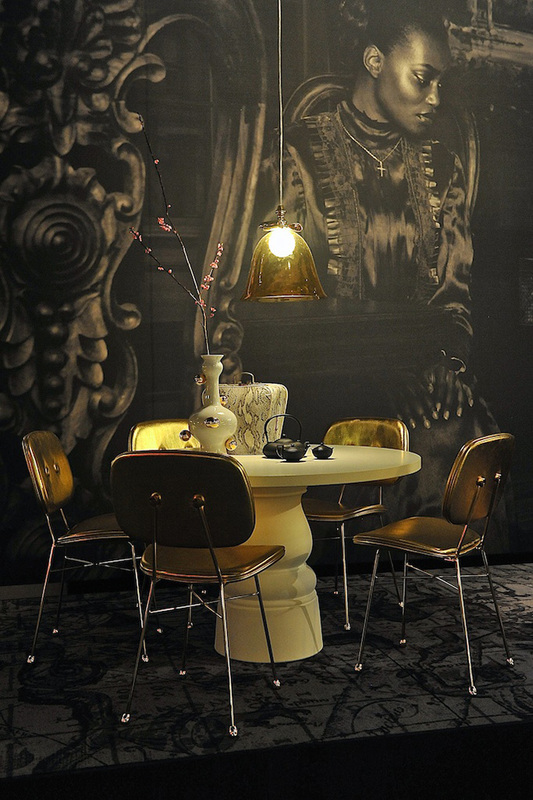 Wow, what fantastic images and omg to get an email from Marcel Wanders, that is so cool. 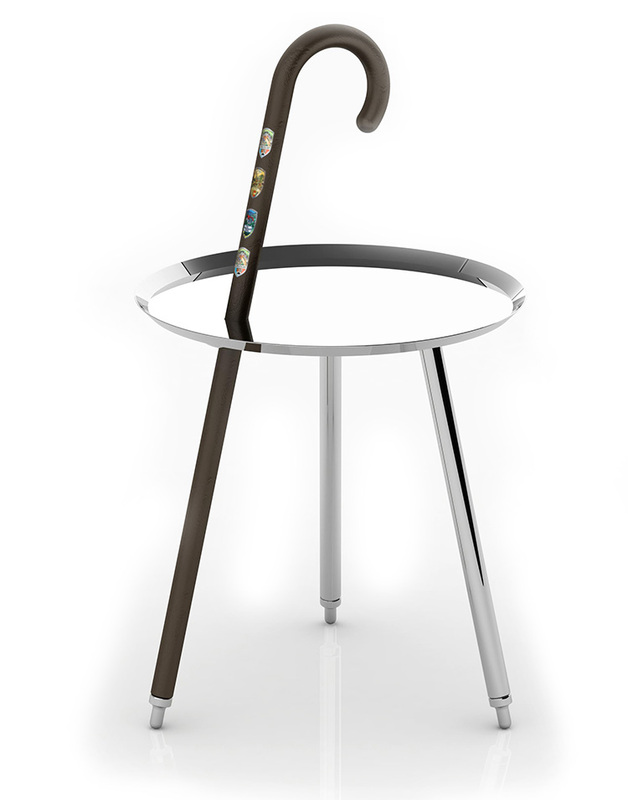 Love the Bert chair you’re sitting on, so cute! 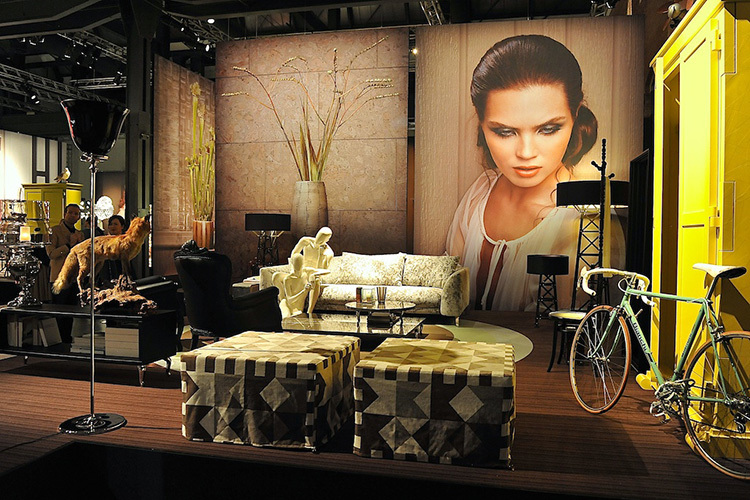 I know, it was pretty darn cool… And the lil Bert chair was really comfy too!